Contains ingredient that removes stains from traces of food, wine, dirt, darkening from sweat. Removes dirt and discolouration on collars and sleeves. Can be used on baby's clothing. Has antibacterial effect and removes odours. Works faster in hot water. However it is effective in cold water as well. 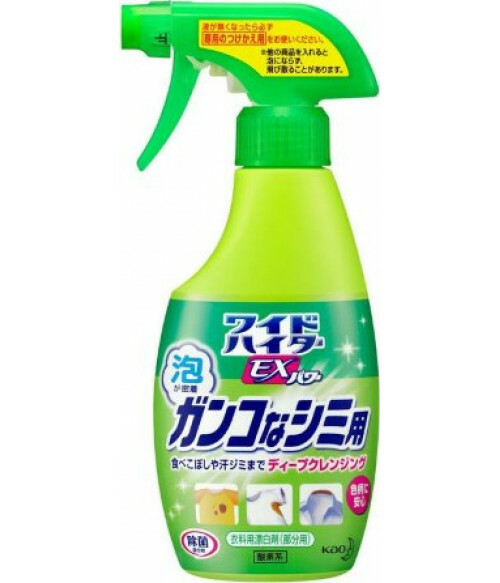 Can be used in the clothing as pre-treatment before washing. To remove stains on coloured clothing that are easier to get rid off, apply stain remover on the stained area but do not leave for more than 5 minutes. For difficult to remove stains apply stain remover on the stain and soak in water for no longer than 30 minutes. Then rinse well with cold water. If you are afraid of colour change of the clothing when mixing with detergent, please soak your clothing for 5 minutes first to see whether the effect of the stain remover. If no effect is visible, then it can be used on the clothing. Do not used in very hot water. Do not mix with chorine bleach. Do not leave in direct sunlight or heat. In case of the contact with eyes, immediately rinse your eyes with water and contact the doctor if needed.